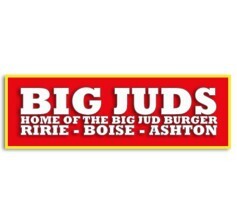 Big Jud’s: Take $5 OFF the Big Jud Deal (1 lb. Burger, Large Fry, 2 Drinks, & 2 Single Waffle Cones)! Take advantage of this classic deal today at Big Jud’s! Take $5 Off the Big Jud Big Deal! You get the Famous 1 lb Burger, Large Fry, 2 Drinks, & 2 Single Waffle Cones (reg. price is $22.99)! *Located at 411 West 7800 South. *Valid 4/15.